Abstract: Patriot's Supersonic 64GB USB 3.0 thumb drive can copy an 8.5GB MKV movie file over to a PC in 2 minutes 39 seconds via USB 3.0 port, or about 5 minutes via a USB 2.0 port. By comparison, it takes 7 minutes 33 seconds for an older single channel USB 2.0 drive to move this same 8.5GB movie file over to the PC. Thumb drive capacities are perpetually on the increase, yet the USB 2.0 interface that seemed so fast in the era of 64MB and 128MB flash drives is now inexcusably slow for thumb drives of 32GB, let alone external hard drives. With almost 10 years having passed since the USB consortium last updated its namesake standard, the arrival of USB 3.0 has been long overdue. At first only a few Intel P55 motherboards featured the new USB port, now it can be found on most every Intel Z68/P67/H67 and AMD 990FX motherboard available. With it, users have the option of using USB 3.0 devices capable of moving data at a quick 4.8Gbit/s, a 10x boost up from the 480Mbit/s rate of USB 2.0. As Yoda might say, USB transfer speeds are once again balanced with the multi-gigabyte storage capacities of today. That brings us to the focus of this review, a slim little 64GB USB 3.0 thumb drive made by Patriot Memory. The Patriot Supersonic is one of the first quad-channel/single chip controller based USB 3.0 flash drives to hit the streets. It comes in capacities of 32GB or 64GB and retails for about $180USD. 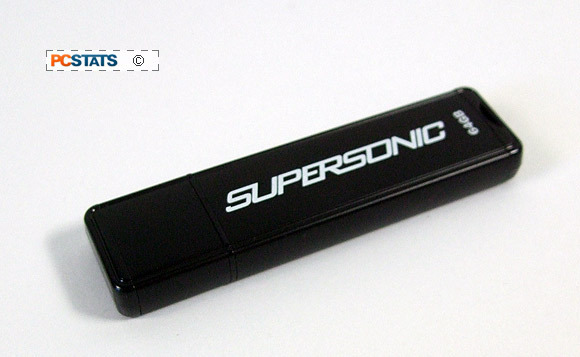 When connected to a USB 3.0 port, the Patriot Supersonic thumb drive can reach burst transfer speeds of 100MB/s read and 70MB/s write according to the manufacturer. In PCSTATS' tests we achieved peak transfer rates of about 114MB/s read and 60MB/s write in CrystalDiskMark 2.2. To put these transfer speeds into perspective, Patriot's Supersonic 64GB USB 3.0 thumb drive can copy an 8.5GB MKV movie file over to a PC in 2 minutes 39 seconds via USB 3.0 port, or about 5 minutes via a USB 2.0 port. By comparison, it takes 7 minutes 33 seconds for an older single channel USB 2.0 drive to move this same 8.5GB movie file over to the PC. This is a simple test you can try for yourself right now, find an 8.5GB file and time how long it takes to transfer it over to your USB drive. 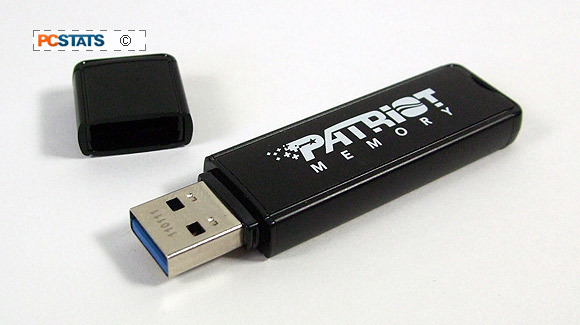 The Patriot Memory Supersonic 64GB USB 3.0 memory stick measures 70x19x8mm in size. It's housed in a black extruded aluminum case that feels sturdy enough, a click-on cap protects the jack from dust. The thumb drive has one red LED tucked away by the lanyard hook which indicates when data transfers are occuring. The drive works with Windows XP/Vista/7 & Apple operating systems. This USB thumb drive is slim enough to use with horizontally and vertically stacked USB ports; this is something you'll want to be mindful with bulky USB thumb drives, sometimes they block adjacent USB ports. 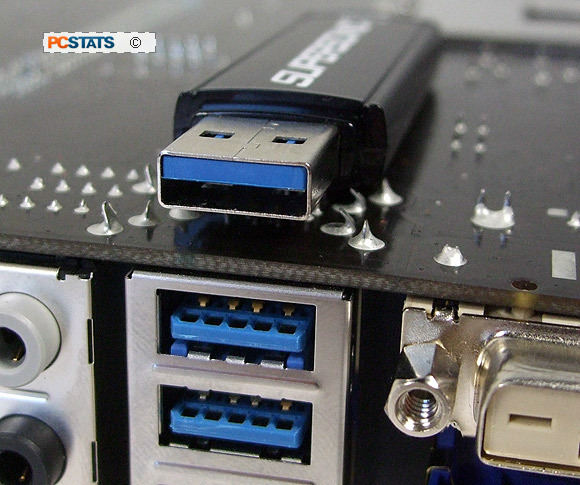 USB 3.0 is the third major revision of the Universal Serial Bus standard that runs everything from your mouse and keyboard to flash drives and external hard drive docking stations. It brings with it a couple benefits in addition to a speed boost, such as Sync-n-go (USB devices are instantly available), backwards compatibility, bidirectional dual simplex data transfer protocol and better power efficiency so there is less power usage when it is active or in an idle power state (no device polling). USB 3.0 ports are identifiable by their blue colour and nine electrical connector pins. The Patriot Memory Supersonic USB 3.0 thumb drive is a quad-channel flash memory device; this relatively new term describes a way of speeding up USB 3.0 thumb drive data access within the device itself. If we've got this right; "Quad-Channel" means there are two 32GB flash chips in the 64GB Patriot Supersonic that each have a dedicated set of address/data lines and on top of this the flash memory is addressed in parallel, in a sort of RAID 0 manner - hence 2x chips by 2x access = 4x channel. Older USB 2.0 thumb drives are single channel devices, meaning data rates inside the drive are limited to the speed of the flash memory chip. In cases where two flash chips are used to double storage capacity, one address/data line is switched between the memory as needed. On the horizon manufacturers are working towards Eight-channel flash memory thumb drives that will act more like SSDs than true flash drives, so keep an eye out for future USB 3.0 thumb drives that offer performance levels even closer to those of Solid State Drives. A pair of USB 3.0 female ports on a motherboard with Patriot's Supersonic 64GB USB thumb drive showing the male USB 3.0 plug. As you would expect, USB 3.0 ports and devices are backwards compatible with USB 2.0 and USB 1.1. However, USB 3.0 devices will operate at 480Mbit/s when connected to USB 2.0 ports. Conversely, USB 2.0 devices are limited to USB 2.0 speeds when inserted in a USB 3.0 port. Because of the back-end technology changes, you need both a USB 3.0 port and USB 3.0 device to get the full speed. USB 2.0 and USB 3.0 ports photographed upside down so you can see the different number of electrical connections. 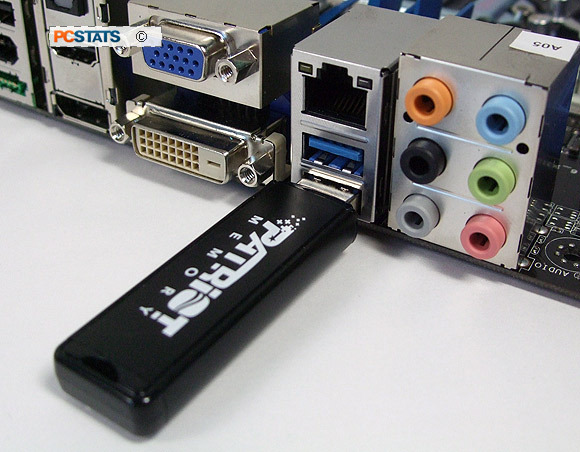 Next up, PCSTATS benchmarks the Patriot Memory 64GB Supersonic USB 3.0 thumb drive.... hint: it's bloody fast!